Monday 4 September 2017 was a day to remember for 58 of Porirua's young leaders. This was the third celebration of the 'Gift to the World Leadership Awards' inaugurated in 2015 to celebrate the 50th Anniversary of Porirua. 'Porirua’s young future leaders were honoured today for going the extra mile to serve their schools and the community. 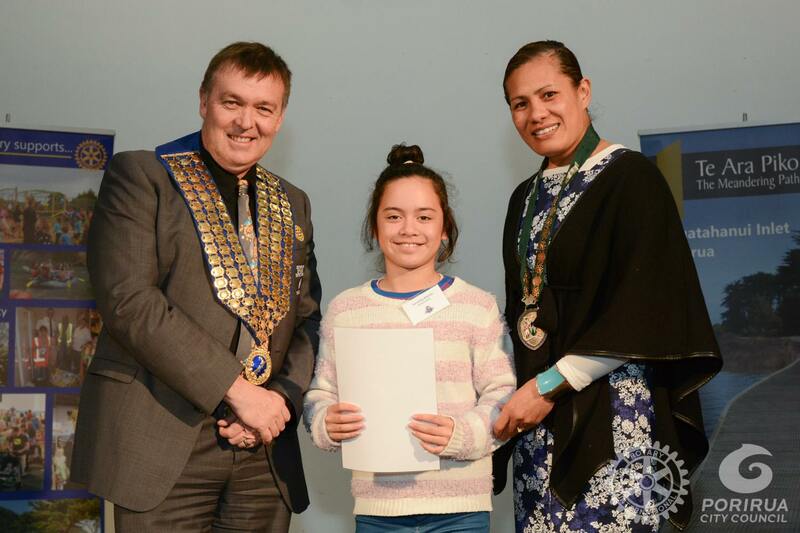 The Rotary Clubs of Porirua and Porirua City Council presented Primary School Leadership Awards to 58 local school children at a ceremony at Elim Church. The awards were presented by Porirua Deputy Mayor Izzy Ford, who said it was great to see so many wonderful young people being celebrated. The children were selected by principals from primary schools throughout Porirua. Two senior students from each school were chosen based on leadership, service above self, and being role models. The students had been involved in a range of activities including student councils, organising fundraising or leading dance, sporting or cultural groups. Mana MP Kris Faafoi said this exceptional group of young people were leading the way. "I'm really heartened to look at testimonials of each recipient and see that they're all doing such a great job of leading in diverse areas. "These young leaders are setting a great foundation on environmental issues, enjoying different cultures, helping those in our community who need assistance and importantly their fellow friends at school. I agree with our Deputy Mayor, our city will be in great shape in the future with these young leaders at the helm." Porirua Principals submitted a bio for each child they put forward to receive an award. In addition to receiving a certificate from the Deputy Mayor, each child was presented with the 2017-2018 theme badge of Rotary International, ' Rotary: Making a Difference", by the District Governor of District 9940, Mitch Brown. Here are the bios and photos for each child. More photos, taken at the event, are available in our Gallery here. Gemma is one of our outstanding students at school. She coaches hockey, helps out in the PE Shed, Library, Road Patrol, our junior reading programme and is Deputy Head of the Student Council. Outside of school she writes book reviews for the Whitby Library, and has had a few of her own written works published. She also fundraises for Guide dogs, World Vision, Wellington Children's Hospital and Cure Kids. She is a Scouts Patrol Leader, has participated in the Stanford Leadership Course and even made submissions to the Mayor of Porirua. She recently returned from Space Camp in the USA, achieving a Hall of Fame Scholarship for showing values that NASA believe in and uphold. Arene's leadership qualities are borne out very much in the sporting arena. She excels in and is captain of her Turbo Touch Team, Mana Rugby Team and Club Softball Team. She is a member of the under 13 Super City Baseball Team, a member of the Wellington under 15 Girls Softball Team (undefeated champions) the New Zealand under 14 Basketball training squad and recently travelled to the USA as a member of the New Zealand under 13 baseball team, where her team won New Zealand's first ever baseball title. Arena has helped to organise numerous sporting events at school and is one of our more proactive House Captains. When asked why she likes being a leader she said "I like to help people to be the best they can be and see the development and changes in their behaviour. It makes me feel happy and good that I can have that effect on others." When asked what she sees as important aspects of being a leader, she said "Always listen to others, think positively, be humble, lead by example, lift others up." Wendy-Dawn is a mature student who shows diligence in her learning. This proves to be a great asset in her leadership as she demonstrates to others how to be a focused and determined learner. Wendy-Dawn has a quiet leadership style and guides her peers onto the right path. Although Wendy-Dawn's Year 7 year was turbulent she has risen above it and shown inner strength. She has always been a great help, giving support to her peers and teachers. Wendy-Dawn is reliable, trustworthy and generous with her time. She has a very bright future ahead of her. Mannfred is a very bright and capable student who works hard to achieve, and through his dedication to his education is a positive role-model to his peers, especially the boys. It is hard and often a challenge to stand out from your peers and Mannfred shows his strength in leadership by standing out for all the right reasons. He is a mature, responsible, and reliable person. He has sound values and respect for his elders and peers. Mannfred has a promising future and the potential to be a senior school leader. Awarded to Va’a for being the Student Council co-leader for 2017, for public speaking and being a mature role model for others to follow. Va’a is able to motivate and inspire students to engage with true Brandon PRIDE. Brandon Intermediate is very proud and thankful for the contribution Va’a has made to the school. Awarded to Sheila for being the Student Council leader for 2017, for public speaking and being a mature role model for others to follow. Sheila is able to Motivate and inspire students to engage with true Brandon PRIDE. Brandon Intermediate is very proud and thankful for the contribution Sheila has made to the school. Jade is a very conscientious young girl who thinks about her environment and how her actions affect the world around her. She engages in all opportunities that present themselves at school and is aware that this will play an important part in her development. She has responsibility for roles in the wider school community as a librarian, road patrol monitor, fruit monitor and lunch monitor, as well as in class responsibilities. She is often asked to lead groups as she has a gentle yet firm leadership style. Jade participates in all interschool sports teams and is a competent athlete. She has been playing the violin for three years and was seven when she started with the virtuoso strings orchestra. Jade loves learning and has a fantastic attitude towards her own education. She has a very bright future ahead of her. Breana is a vibrant and energetic girl with an extremely positive outlook in her role as a school leader. She has a lot to give and is willing to give even more. Breana loves and will participate in all things sport. She represents the school in all school sports tournaments and has always displayed integrity and sportsmanship to the highest degree. She is a confident and able athlete. Breana has taken on responsibilities in the wider school community learning to communicate with other schools to use the 2-way radio for civil defence purposes in schools. She is a school librarian, a road patrol monitor, staff room monitor and distributes school lunches daily. Breana has a great attitude towards academic education and is able to demonstrate her ability successfully and competently. She is someone to look out for in the future. Claudia is always very positive, cheerful, and kind. She always treats others with respect and consideration. She ensures others are included in play and in all learning activities and will take the time to show and explain ideas to others so they feel comfortable and confident to participate. Claudia is a valued team member. She will happily work with anyone and can confidently share her thinking, while also being open to others’ ideas. Claudia is able to self-manage in any situation. She shows resilience in overcoming challenging tasks and will reflect, seek feedback, and persevere until she achieves her goal. Claudia is highly regarded by students of all ages, staff, parents and community members. Claudia participates positively in all class and school activities. She isn’t afraid to step out of her comfort zone by confidently taking risks and trying new things. Claudia takes advantage of all opportunities when they occur, and gets involved in as many activities as possible. Claudia is a school leader in many areas including ICT and e-learning, culture and performing arts, public speaking and presenting, and fundraising and community events. Claudia regularly speaks in front of large groups of adults; visiting researchers, teachers and principals, and corporate and charitable sponsors, from all over the world. She shares her learning with them and discusses the positive impact of having access to 1:1 digital devices at school and home. Claudia is also a member of our senior. netball team, the Corinna Kapa Haka and Senior Samoan Polyfest Groups, as well as the very talented Virtuoso Violin Orchestra. Claudia is relied on by staff to support them with ICT and running school events. She can do so confidently and capably with short notice. Analia is always friendly, caring and fun. She will work with anyone and takes on different roles and responsibilities in a team, ensuring everyone gets a say and a chance to be a leader. She fully participates in all learning activities and supports and encourages others to do the same. Analia always shares her clever ideas and strategies to help her group to solve challenging problems. She can listen respectfully to others and will confidently agree or disagree using specific examples to justify her thinking. A strength of Analia’s is that she is willing to gracefully accept if she has been proven wrong, and will always give credit where it is due. Analia is a motivated and enthusiastic learner. She is goal orientated and will persevere and remain resilient, to overcome any challenge to achieve to the best of her ability. She has many skills and talents such as writing, drama, debating and public speaking. She has worked hard to be able to develop her confidence so she can share these skills with a wider audience, for example at School Hui and Community events. Analia is a school librarian, a Chromebook Ambassador, an ICT and student portal Technician, a whanau and school Hui Leader, facilitator of the Y8 Fundraising Committee, a member of our senior netball team and senior leader of our Tokelauan Polyfest Group. Playing in the netball team and participating in some of the activities while on school camp this year were experiences that were right out of Analia’s comfort zone. Analia also regularly speaks in front of large groups of adults; visiting researchers, teachers and principals, and corporate and charitable sponsors, to share her learning and discuss the positive impact of having access to 1:1 digital devices at school and home. Rhian is a diligent, responsible and caring leader, who stands up for the rights of herself and others. She gives up her time to be involved as the reporter and editor of the ‘Green Team’ school newspaper and has taken on a leadership role in Kapa Haka. Rhian has an incredibly bright future ahead. Leo is a fantastic senior role model at Discovery School; he was voted by his peers to be on our school council and willingly gives his time to help others, such as being a student librarian. Leo has represented Discovery School in sports on multiple occasions, where he demonstrates an ability to lead other students. He is a leader during Kapa Haka and he has presented during our termly powhiri. Leo does well academically, achieving pleasing results in external and internal testing. We believe that Leo is an excellent choice to receive this award. Victoria excels in a range of academic areas. She is currently a house captain and is always a great role model for younger students. She is an independent learner who takes on new challenges confidently. She displays great work habits and self-management skills and can always be relied upon to show Glenview “MANA” values. She is a member of the cricket U13 rep team, as well as the school basketball and rugby teams. Temalo has shown a marked improvement over his time at Glenview in self-management, academic, cultural and sporting contexts. He models manaakitanga, respect to younger members of the school, in his capacity as a house captain. He has had leadership roles as Kaea Tane of our school Kapa Haka group and is always on hand to share his digital knowledge and problem-solving skills with students and staff. He is also a member of the basketball, rugby, and U13 cricket teams. Vanessa's strengths have always been her ability to adapt, engage thoughtfully with others and will always lead through action. Vanessa is quiet by nature and very unassuming but brave and has willingness to try when asked and this has been demonstrated by taking on an opportunity to lead school assemblies. She demonstrates respect and support to both staff and students. Vanessa enjoys the opportunity to do something for others. She is a quiet leader who other students respond well to, happily follow and enjoy working with. Marley is a natural leader who likes to lead from the front. In his role as student council leader he is able to gather the students together and concentrate on specific tasks until an appropriate outcome is reached. He methodically works through a process to reach a solution and he listens well to others. His attendance at school is close to 100% so he hasn't missed anything that happens at school. He is insightful and reflective in his thought and his words. He is articulate and well spoken. He shows diligence and integrity when dealing with students and teacher alike. He is a very suitable candidate for this award. Ranfurly is a determined and positive year 6 role model. He has not always found learning easy and has persevered to make big improvements in his learning. He is a thoughtful friend and schoolmate and is a member of the Maraeroa School student council. Ranfurly is growing into a self-assured young man whose passion will carry him far. Hunter is a quiet and intuitive year 6 leader. She has high expectations for herself and for others. She works to push others forward or raise them up, all the time working to achieve at a high level herself. Hunter is consistent and reliable in her leadership roles from class based to school-wide. Her sense of empathy will make her an effective future community leader. Paris-Hayze is a thoughtful young lady who enjoys learning. She is becoming more confident at allowing herself to enjoy this journey of discovery. She delights at learning new things and her very presence enhances our school. Ropati is a safe and caring pair of hands. Always a respectful and thoughtful young man, he treats us with respect and you cannot help but reciprocate. He prides himself on his good manners and is a wonderful role model for our school. Beau-Wehi Rei is a humble boy who lives a life with integrity. We can all count on Beau to help out when needed. He is a confident and clear orator who speaks at our school events such as Pōwhiri, assemblies and parent evenings. Sarah is a friendly and compassionate girl who is constantly finding ways to be help out others. Sarah knows our school inside and out as she can be trusted to do jobs by all members of staff. She not only works hard in the classroom, but when representing our school in sports. Zoe is hard-working, diligent, and responsible as she manages her learning alongside her numerous out of class commitments, such as being a Dance Splash choreographer, a key member of our Enviroschools team and a whānau leader. Zoe also brings a sense of humour and fun to everything she does, striving to stay positive and persevere even in challenging situations. Jarrod brings his awesome sense of humour to all he does, approaching his learning with enthusiasm and energy. He leads as a whānau leader with confidence, kindness and a keen sense of responsibility both in class and out of it. He loves to find the fun in everything he does and tries to focus on the positive in challenging situations. Tanika is a very cheerful and incredibly kind student who shows manaakitanga to everyone she meets. You can always count on her to volunteer to help. She shows aroha to everyone around her often putting their needs before her own. You can count on Tanika to get involved in everything and always do her best. She is an amazing person to have on your team! Harry has a great sense of identity and is not afraid to be himself! He loves to be involved and goes the extra mile to participate and contribute. Currently, Harry is an active and engaged member of our kids’ parliament, a talented actor and dancer who is playing a major role in our school production as well as choreographing and teaching a dance to other students. As a wonderful friend, Harry shows lots of empathy and respect to those around him. Emie displays a wide range of leadership qualities in all aspects of school life. One of the most noticeable is her empathy for others and her desire to serve others in the interest of equity. Emie can more often than not be seen caring for and encouraging others, especially those who need the most support. She exemplifies the Pauatahanui School values of Perseverance, Ambition, Understanding and Attitude at all times. Alexander is one of those students who is incredibly driven to achieve the next step in his learning. He consistently displays the Pauatahanui School values of Attitude, Ambition and Understanding. He conducts himself in a mature, caring and selfless manner at all times. Alexander proactively looks for opportunities to help out in the classroom and is always the first to volunteer for any jobs that need doing. As a senior student in the last two years in particular, Zoe has really demonstrated her qualities as a leader in the school. She has been a member of the School Council, on the organising committee for the senior social, a school librarian, a member of the School Rock Band, a school representative in netball, cross country, in swimming and in the ski team. Zoe is a quiet achiever who is very modest about her achievements and is giving back to the school in supporting younger students. Jessica first demonstrated her leadership ability in Year 4 when she organised an Olympics event for her syndicate of 100 plus students. Her recent leadership has been as a member of the School council, on the organising committee of the senior social, as a member of the School Rock Band, and as a representative and umpire in netball for a Year 5 & 6 tournament. Jessica is always willing to put service before self and recently demonstrated this as a bell ringer for our parent interviews, willingly giving her time to assist the teachers. Serenity demonstrates consistent excellence in all areas of her education. She is a determined and focused learner who constantly strives to achieve her learning and life goals. In addition to this, she is a thoughtful and considerate member of Porirua School, who leads by example and is a positive influence on other students. We are excited to see what the future holds for this incredible young lady! An exceptional role model at Porirua School, Tane consistently makes positive decisions that ensure his success in all academic and social situations. His virtuous nature ensures he maintains positive relationships with others, thus he is a well-liked and respected member of the Porirua School Community. We are extremely lucky to have him, and thank him for all of his valuable contributions to the school. Punipuao consistently demonstrates leadership at Postgate School. She volunteers to help without being asked and strives to create a positive environment inside and outside the classroom. She helps others with their learning and ensures that all children have someone to play with. Her laugh is infectious, brightening up the day for all those around her. Leilani is Postgate PRIDE! She exudes positiveness in everything she does. Leilani is a lead by example leader. She is always willing to support others, ensuring everyone is challenging themselves to reach their potential. Leilani is a fantastic leader and Postgate is lucky to have her as a role model. Isaac demonstrates leadership. He is a year 8 student who has been instrumental in the establishment of the Pukerua Bay School Museum. From simple beginnings in a house in Pukerua Bay, Isaac and his friends Paddy and Aurelia developed a plan to create a museum, run by students, about areas of interest of students and has shared this with both the local community and globally. Isaac has helped to speak at a nationwide Museums Aotearoa Conference and has presented to Wellington Principals about their aims in establishing a Museum. He and the Museum Team have a digital presence and have been retweeted from academics both in NZ and in the UK. Creating a succession plan so that the museum continues long after the original team moves onto college shows the commitment Isaac and the team have to their passion. Devlin demonstrates service. He is a Year 8 student who has used his wonderful empathetic nature and interpersonal skills to help a fellow student in his class who is on the Autism spectrum. Devlin has worked alongside the student to help him plan his daily timetable that encouraged social interactions with his peers. Devlin has consistently thought of ways to bring positive socialisation and experiences to his classmate, including firsts such as helping him in preparing, making and eating a full chicken roast lunch, to being part of a noho and sleeping away from home for the first time. It is his thinking of how he can support the needs of others that makes Devlin a perfect candidate for this award. Acosta is an outstanding leader. He leads from the front, motivating and encouraging others. Acosta confidently leads our school with kapahaka, music and officiating at school events. Acosta is positive and inspires others with his work ethic and behaviour at school. He embodies the values of respect that Rangikura School represents. We are very proud of you Acosta! Molly leads others through her positive personality, her work ethic and her honesty and integrity. Molly has led some big leadership projects at Rangikura School and has done so with intelligence, common sense and a calm manner. She is kind and caring of others around her, role models the values of Rangikura School daily and can be relied upon to get to "get the job done." Awesome work Molly. We are very proud of you! Tina is a quiet and unassuming student. She works hard, is courteous, polite and the epitome of H.E.A.R.T, Honesty, Empathy, Aroha, Respect and Teamwork, our Russell School values. She is ALWAYS a fantastic role model for Russell School. She is honest, empathetic and always thinks about the welfare of others. Tina is one of our school office monitors. She is reliable, efficient and welcoming and is often called upon to do extra duties. Solomon thinks nothing of putting his hand up for responsibilities. He is dedicated and works hard to achieve, not only for himself but for others also. He understands the concept of Teamwork and often steps up for Road Patrols, wet day duty or wherever there is a gap that needs filling. Aroha – cherishing all people is one of the key values of Russell Schools H.E.A.R.T. Solomon does cherish all people. We see evidence of this daily through his actions and his sense of community. He thinks about others, he thinks about what is best for the team, he thinks about what his contribution will be and how his contribution effects the team/school as a whole. Kimora-Lee is a year 6 student at St Pius X School. During her time at this school, she has shown herself to be a capable, decisive and responsible leader. She is a key leader in the school’s Kapa Haka group. Kimora-Lee is a friendly and helpful student who shows many traits of a positive future leader. She is considerate and thoughtful as well as forward thinking and a great role model to other students at our school. Naylan is a year 6 student at St Pius X School. During his time at this school, he has shown himself to be a caring, responsible and reliable leader. He is the key leader in the school’s Kapa Haka group. Naylan is passionate about rugby and recently invited Dane Coles and TJ Perenara to our school to talk about their lives as professional rugby players. This is one example of the how decisive and thoughtful Naylan is at our school. He shows many excellent leadership traits and is a positive role model. Toby is a wonderful example to others and nothing is too much trouble for him. He is always there to help others out and is kind and caring to everyone he encounters. He is an environmental leader at our school and takes his responsibilities as a leader seriously. Toby is responsible for making sure that our recycling is carried out properly and he assists with our civil defence at school. Toby has worked hard to make others aware of the importance of looking after our local stream, the Taupo Stream and the creatures that live in there. He’s even written letters to make people aware. He is a HERO - a helper, encourager, a role model and an organiser and so deserving of this leadership award. Belle is an excellent example of a leader. She is able to work confidently with others, follow instructions and include others when working on a task. What sets her apart from others is her generosity. Wherever there is a need, Belle will do something about it. She always helps for the good of others and never looks for anything in return. She is an excellent example of leadership in the true sense. St Theresa's appreciates her ability to think of others at home, at school and also people in the wider community through her work with the Young Vinnies. She is a taonga - a true gift to our school. Ruby is a quiet leader in her class. She always looks for opportunities to help her classmates. This comes in many ways: whether supporting her classmates with kind words and encouragement or actively giving support by helping them perform tasks. All the students respect her and she is often mentioned by them for her thoughtfulness and helpfulness. Meg is a very active member of the school. She is also a true leader. She is always reminding others of the things they need to do or bring for the next day of activity. Meg is very proactive to help others with whatever they are doing. She looks for opportunities to serve and actively looks for leadership opportunities for the only reason being that she wants to help. Ko ngā mea ngākaunui ana ki a ia ko te kapa haka, te netipaoro me te mahi tahi ki te taha o te whānau. Ko ngā mea ngākaunui ana ki a ia ko te kapa haka, te netipaoro, te poitūkohu, te mahi tahi ki te taha o ōna hoa ako. Arana is a natural leader who always leads by example. He is a positive role model. He shows maturity in all that he does. He is willing to take on responsibilities and help others, and in doing so does not need reminders due to his strong self-management skills. He shows an awareness of the needs of others beyond his years and does his best to make sure those needs are met. Because of his drive to succeed, he consistently aspires to grow his capabilities and skills and works hard as a leader to encourage this in others. Tumanako is a quiet leader. Often not heard; however, always seen in the background doing the hard work. She has shown a passion to be involved in working on projects for the Porirua City Council and in doing so has showcased the ability to think deeply about the wider picture in order to benefit everyone. Tumanako has a 'can do' attitude. She can always be relied upon to complete any job asked of her efficiently and in a positive manner. This young man is a leader of the future. Jack shows enthusiasm, passion and is highly motivated to do extremely well in all that he chooses to do. His involvement in many activities both in and out of school demonstrates the qualities and maturity that he will take into his future years. He is part of Student Council, Te Ara Moana, School Production, EPRO 8, NZAIMS Games, hosts such events as Trophy Night, Open Night, he can be counted on to do whaikorero, when called upon. He is also a great leader in Kapa Siva. This young lady is also a leader of the future. Rosa has determination, passion and drive and gives 110% to everything that she sets her mind to. She is involved in many extra curricula activities that are on offer and is able to balance these with her out of school commitments. She is involved in Student Council, she is a great actress in our school production, she puts her hand up to be part of hosting Trophy Night, being on the Open Nights organising committee and she too has been a part of Te Ara Moana. Javarn is someone who others go to for help as he’s always willing to lend a helping hand. He treats others fairly and makes positive choices in everything he does. He always greets others with a warm friendly smile. He works hard to keep improving his work and steps up into leadership roles without hesitation. Sapphire is a caring, supportive person who displays quiet confidence and a lovely wairua. She is thoughtful towards others and her self-confidence and calm demeanour helps others feel more certain that they can reach a challenging goal. Sapphire strives to be the best that she can be. She is a positive tuakana whose wairua has filtered down to many of our teina. Monisa is an excellent role model who consistently sets a good example in work habits and attitudes. She supports the junior students in their learning and looks for ways to help. Monisa also contributes to the church community by publishing a weekly bulletin. Monica is a background leader who is appreciated by her peers and adults alike. She manages herself well, always completing work to a high standard and within the set timeframe. She is mindful of the needs of others and volunteers to do extra. Keli is a student who will give up his own time to help with our younger students, he brings such mana to our school and is someone who shows the up most respect to everyone from all walks of life, representing Windley school in many sports and showing others the way to be, Keli is a leader in every sense of the word. Jayliz is vital part of our school support system, a girl who shows leadership qualities in all walks of life from the rugby league field playing for the Titahi Bay Marlins, the Western Bays rep team and the Wellington Women Under 14 Maori team, she is a role model to her peers and the younger students of Windley School and someone our students inspire to be like. Original generation time 1.4796 seconds.